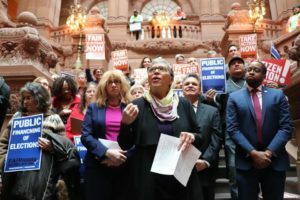 On Monday, April 1, the New York State Assembly and Senate passed a budget bill that, while falling short of creating America’s largest system of small donor public campaign financing, takes a step in the right direction. The bill, which is expected to be signed into law by Gov. Andrew Cuomo, establishes an independent commission that will design a system of small donor public campaign financing for elections to statewide and state legislative positions. The proposed commission would be composed of nine members; Gov. Cuomo, Senate Majority Leader Andrea Stewart-Cousins, and Assembly Speaker Carl Heastie would each choose two members, two would be appointed by the two leaders of the minority party, and Cuomo, Stewart-Cousins, and Heastie would collectively appoint the ninth and final member. Following a public hearing, the commission has until December 1 to propose a statewide system of public campaign financing, which will go into effect on December 22 unless modified. According to a December 2018 analysis by the Brennan Center, the 100 biggest donors contributed more to state candidates during the 2018 election cycle that all 137,000 small donors combined, who made up only five percent of state campaign contributions. The bottom line: We’re making progress, but we still have a long way to go to make small donor public campaign financing a reality in New York and across the country. Keep stamping your money to tell our representatives that our voices matter, and we won’t stop until we have fixed our democracy.